Michael Nielsen has written an indepth and provocative essay on the Future of Science: Building a Better Collective Memory. You can read it here! I was particulary struck by the opportunity to discuss the changes to science in cultural institutions. As our 2009 conference will be focusing on transformations in cultural and scientific communication, I’ve been trying to build my own knowledge around the role cultural institutions play in the development of general understandings of science and how scientific knowledge framed, problematised, created and disseminated in the Web 2.0 environment. I am interested in whether, if the public knew more about scientific knowledge they contribute to controversial debates and if so, how might this change or challenge science policy in the cultural sector? In an earlier article (Science 2.0 Is Open Access Science the Future?, Scientific American, April 2008) , M. Mitchell Waldrop questioned how search engines, social networks, Web 2.0: would affect science. We question whether these shifts will impact on sicence in knowledge institutions, questioning whether they will extend or submerge them? As we move towards the conference I’d be interested in your thoughts. I’m here at the EVA Conference in London. The conference brings together an interesting group of creatives, policy makers and cultural professionals to discuss developments in digital technology and their impacts across the sectors. I saw a very interesting talk today by Patrick Towell, Chair of the Information Society Working Group for the UNESCO UK National Commission. 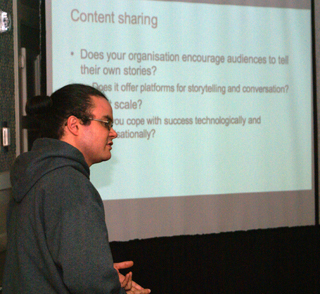 Patrick’s talk centred on the values, visions, beliefs and habits which drive behaviour in the media environment. He suggested that the process of peace was one that needs to be designed and that the use of artistic and technical endevour could be utilised in this process. Patrick talked about the UK government’s remit to promote digital literacy and the implications of this on society as a whole and not only on the intended audience. He discussed the social etiquette that developments in digital environments bring with them and the importance of self awareness, respect, knowledge and self esteem in creating a confident online identity. Some of the questions he posed included: What are the values, beliefs, behavious of media nd how will they impact on the values of the future? ; what is the culture and what are the artefacts of the online experience? ; How can digital media create a culture of peace through action at a distance, collaboration and the development of shared meaning? Patrick concluded by discussing the potential for intercultural dialogue internationally through social media, proposing platforms and mechanisms for creating peace. He introduced the UNESCO 2year pilot project “Power of Peace Network’. It was interesting to note that the notion that connecting into people’s lives and enabling access to content on their own terms is potentially as important to a broad social agenda as it has proven to be in the cultural sector. How do we re-define ‘interaction’ with cultural materials? Here is another installment in my constant musings on the impact of social media on the museum. It’s cold around the country this weekend so enjoy! In the 1990s museum content began to emerge from behind the walls of institutions to appear on distributed websites, and the internet became a common medium through which to display, in a limited way, the cultural knowledge within the institution. This movement ‘beyond the walls’ brought about a rise in debate around notions of deterritorialisation (where the museum was no longer bound by a single built entity) and dematerialisation (where the relationship between audience and institution became more malleable) (Kenderdine 1996, Silverstone 1994). At the same time, critique around the experience of visiting ‘real’ physical sites vs. ‘virtual’ experiences became topical(Pearce 1995; Trant 1998). Since that time, debate has continued to range around the value of online display, the effect that it has on the aura of the object, the authenticity of experience and the power/knowledge relationships with the museum. While the dominate discourses which surrounded the early internet were played out in opposition between the real and the virtual, the implicit critique centred around how such virtual experiences might undermine the expertise and social standing of the museum. Trant suggested how the use of the internet to deliver museum content could be viewed as a potentially powerful networked system which provided greater authority to the museum, by creating trusted cultural networks (1998). While there were some early Australian programs which encouraged cross-institutional content sharing (such as the Australian Museum’s Online project, there was little emphasis on the development of user-created content. This was partly a result of the limited interactivity afforded by early internet technologies and was philosophically underpinned by the dominant discourses of the time. The creation of a new medium in itself did little to respond to the need for audiences to ‘make meaning’ of their experiences (Hooper-Greenhill 2000); the value of community voices and their role in developing a broader understanding of cultural content (Witcomb 1999); the location of the museum within popular culture (Moore 1997) and the experiences and images which audiences bring with them when visiting museums (Wallace 1995). With the advent of social media, those technologies which provide a platform for three-way communication, there is a real possibility to respond to these agendas in a structured way. It could be said that the tools to share this new information online thus forming communities of interest, recontexualizes as Benjamin (1969) had done, the nature of new spaces presented to us in the wake of technological change. Dawson (2002) provides some compelling arguments to suggest that innovation requires collaboration. Three-way communication which responds to the knowledge which audiences bring with them, establishes the foundation for new models of interaction and participation. Without exploring these in structured ways, there is a chance that museums will lose the potential to lead innovation. Poullson and Kale (2004) define commercial experiences as “an engaging act of co-creation between a provider and a consumer wherein the consumer perceives value in the encounter and in the subsequent memory of that encounter.” While their thesis is directed toward the creation of commercial experiences, is it so far from the types of interaction and participation which we would hope to achieve in the cultural sector? The creation of cultural interactive experiences will need to extend to not just interacting with audiences but engaging them in this act of co-creation. In my next post I will be exploring this in more detail. As part of the series on ‘sites’ of display in the museum, I give you this gem – where the ‘real’ becomes virtual! Museum exhibitions have the potential to weave memories of self, to reconfigure adult as re-collector/ child as collector relationships. The museum becomes the mnemonic site for both the factual and remembered world of a collective museum. Reality is mixed with fantasy to produce experiences which are disorienting, explorative and ultimately individual. The art critic, Ralph Rugoff, describes the museum as cluttered with traditional glass showcases, displays of preserved insects, skeletons, minerals, dioramas of science and technology. He has studied the meticulously researched and exhaustively written captions, has considered the dim lighting and factual displays. But somewhere within this meticulous display of Jurassic Technology, Rugoff describes a ‘faint scratching at the back of the mind”(Rugoff, 1995: 69-81). The museum publishes an explanatory pamphlet where it describes itself as an educational institution “dedicated to the advancement of knowledge and public appreciation of the Lower Jurassic.” It provides the academic community with a specialised knowledge space where research and display come together, combining relics and artefacts with an emphasis on unusual or curious qualities. The pamphlet describes the term museum as a spot dedicated to the muses, a “place where man’s mind could attain a mood of aloofness above everyday affairs“. The pamphlet introduces the scholars whose works are collected and displayed, their personal histories and the function of their research within the greater scientific environment. Rather than conveying ready to digest information, the exhibits unsettle with information about information. The artifacts start to dematerialize into a field of questions about display and the nature of knowledge. Instead of asking viewers to suspend disbelief, it leads us beyond belief. The museum does not discredit rational scholarship, rather it embraces its rhetoric as a peculiar and distinctive voice which it uses to consciously fuse real events with imaginary ones, true research with specious discourse. Rugoff proposes that this model of museum presents a technology for altering habitual ways of seeing and thinking, thus freeing us from the museum’s traditional objectivity and opening the way to our individual recovery of authority in the subjective museum-going experience. While the museum disorients and confuses, it leaves us with the feeling that questions are worth holding onto and that uncertainty plays a part in the pleasure of the social act of museum-going. The Museum of Jurassic Technology remains one of the few long-standing examples of how our collective memory of the museum can be reconceptualised to create a virtual physical space. If you get a chance, you should visit it! New USA/ Queensland Fellowship announced! Some of you may have had the chance to see Caroline Payson from the Cooper Hewitt National Design Museum (CHNDM) in New York when she was here in Australia in February. 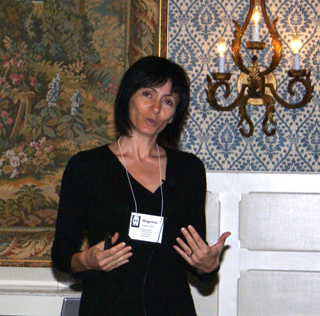 Caroline gave talks and workshops as part of the Social Media and Cultural Communication Conference in Sydney. Arts Queensland very kindly sponsored Caroline to speak in Brisbane! Following that series of talks and workshops, Queensland Premiere Anna Bligh has just announced a new Educational Fellowship with the Cooper Hewitt! You can read about it here! We’re very excited about this Fellowship! Obviously we’re excited for the educators who will be working with CHNDM but we’re also very excited that the research and dissemination that we’ve been leading through these two projects (New Literacy, New Audiences and Engaging with Social Media in Museums) has inspired such a prestigious ‘real-world’ outcome! The Fellowship will enable an educator to spend several months in New York, working with CHNDM to develop design resources which will then be shared by students and teachers in Queensland. The State Library of Queensland, one of our major partners, will hold the resources to ensure they are accessible to teachers across the state. For those of you who are interested in the CHNDM educational initiatives which are at the heart of this Fellowship, follow this link! Well done to the Queensland Premier, Arts Queensland and State Development for developing this initiative! We look forward to inspiring similarly exciting ventures with other state agencies across Australia! Why is there so much debate around the virtual and the real? It’s 2008 and in every symposium, every conference and every post-event email I’ve participated in, someone will mention the need to ensure that we don’t do away with the ‘real’ museum experience. I have to say that after studying museum communication for almost ten years, I do find this fascinating. Why do so many museum professionals consider the ‘virtual’ and ‘real’ to be in opposition, suggesting that one supersedes the other? Mal’s recent response to the Dawson blog post has propelled me to do a series of posts on the ‘sites’ within which museum communication occurs. I will describe these ‘sites’ as frameworks for museum communication and audience participation. The sites stem from a need to communicate and are the result of strategic planning regarding the way in which audiences relate to content. Over the past years, I’ve played with the idea of a ‘memory site’ and while I haven’t spoken about it explicitly within workshops and presentations, it underpins the way in which I’ve thought, written and developed workshops (in collaboration with Seb and Jerry) around social media. I’d like to present a bit of that thinking here so, as Seb says, grab a hot drink and pull up a chair! Halbwachs (1992: 78-84) suggested memories were recalled by time periods; by recollecting places visited and by situating ideas or images in patterns of thought belonging to specific social groups. Memory was essentially social; it could orient experience by linking an individual to family traditions, customs of class, religious beliefs or specific spaces. For Halbwachs, memory was based on lived experience, something that could be plucked from the past and seized by the individual in the manner of naïve and immediate knowledge. Memory had to be linked to lived experience, otherwise it was reduced to history becoming abstract or intellectualized reconstruction, debased or faked recollections. Memory made the visitor aware of time and offered a perspective on the past. Memory always unfolded in spaces, as when they could not be located in the social space of a group, then remembrance would fail. Consequently Halbwachs deduced that the activity of recollection must be based on spatial reconstruction. In 1996 Boyer (135) proposed that museums present a fundamental distinction between history and memory. If, as Halbwach’s asserted, where tradition ends, history begins, then as long as memory stays alive within a group’s collective experience, there is no necessity to write it down or to fix it as the official story of events. But when distance appears, opening a gap between the enactment of the past and the recall of the present, then history begins to be artificially recreated. He suggested that the study of history could divide time into static periods and didactic stages, when in reality, time had no such boundaries. History presents fragments and details as a unitary whole, relocating these within newly erected frameworks. The framework in turn enables the historian to establish comparisons and contrasts, recomposing the variety of times and places into a uniform pattern. This newly formed structure becomes the basis of the vision of the past and can be identified in the museum where visions of the past were often erected and maintained credence as idyllic, universal truths. The contemporary museum develops a collective memory which suits the complex content of our times. Globalisation, nomadic work practices, migration and a cult of individualism have severed the ties between physical and collective memory. If collective memory is linked to social and physical spaces and related to the transmission of those values and traditions through the spaces it creates, then it is possible that as Deleuze (1989) suggests, we are in the grip of a memory crisis. Deleuze (251) proposes that our memory crisis is based on our need to establish counter-memories, resisting the dominant coding of images and representations which are embedded in our way of being and by recovering the differences in site, space, action, intention and experience which have been erased. If this is the case, then the ‘next wave’ of museum practice will be compelled to create new sites for exploration, to present new connections between spaces, places and people, presenting new social and cultural imaginaries. The new sites will need to allow for individual experiences to develop, drawing together ‘remembered’ associations with new communities, thus creating contemporary forms of collective memory. Social media provide us with the tools to share this new information online thus forming communities of interest, recontexualizing, as Benjamin (1969) had done, the nature of new spaces presented to us in the wake of technological change. I posit then that the ‘memory site’ is one which encourages audiences to develop their own experiences through engagement with collections and participation in social networks. Our research has demonstrated the types of sites where strategic engagement can be effectively developed. This blog and the museum30.ning site continue to draw new audiences and increasingly, greater participation, than we could have achieved through conventional publication (though we continue to do that too)! I think that the continuing discourse which sees virtual and real in opposition to each other, is perhaps more a product of what Baudrillard (1992: 92) describes as a paradox of our contemporary memory crisis. He suggests that our objections may be based less on the production of synthetic memory than the migration of history into advertising and the nostalgia industry. We are creators and participants in the nostalgia industry in many ways and ironically, when we continue to pit ‘real’ against ‘virtual’ we are actually creating our own synthetic memory of what a museum should be. In doing so, we undermine the value of cultural participation, suggesting that one is more ‘real’ than the other. Who are the agents for cultural change? Can you use chaos and volatility to your own ends? Develop future scenarios – what are the things in your environment which are telling you that these futures are coming through? What are the five things you would save? What are the risks of change? You can view Lynda’s slides here! Where do creative communities sit in relation to museum collections? Indigenous narratives in museums are still not controlled by indigenous people. Who does control the narratives? Relevant, provocative and innovative – are we? Support research to increase holistic understanding of sector future audience base to provide focus for further innovation and strategic investment. This year’s program is the best yet! With a wide range of speakers covering a multitude of topics, Museums and the Web continues to be the leading conference for those interested in digital developments in the sector. Seb Chan and I delivered the next iteration of ‘Planning for Social Media’ yesterday. Once again we had a great audience who were extremely generous in their participation. I’ve uploaded the 080408mw08v2print-compatibility-mode”>planning slides for those of you who might be interested in developing social media in your organisations. I’m always happy to discuss so please contact me here or via email at arusso@swin.edu.au. I’ve also set up a Ning Group on the Museum30 Ning site. You can find this group, ‘Engaging with Social Media in Museums’ at http://www.museum30.ning.com. It would be great if you joined the discussion! The following update was prepared by Lea Giles Peters, State Librarian, the State Library of Queensland. We thank her for her thoughts and contribution to the recent visit by Caroline Payson from the Smithsonian Institution. The State Library of Queensland, along with Arts Queensland and the ARC Centre of Excellence for Creative Industries and Innovation, was very pleased to host Caroline Payson from the Cooper Hewitt National Design Museum, New York in Brisbane in February. This event occurred through our partnership project NEW LITERACIES, NEW AUDIENCES which is probing the use and potential of social media in outreach and public programs of cultural institutions. Like Cooper Hewitt we want to develop the capacity and contribution of libraries in cultivating good design in Queensland. We think of design as both process and outcomes. We currently have Christina Waterson as designer in residence at the State Library of Queensland, creating a magnificent pendant light for the Knowledge Walk. In the last year we have also enjoyed collaborating with tertiary design schools on various projects. Sustainability is a key driver and focus of our public programming and we promise an exciting year ahead with talks and exhibitions that will generate valuable insights and debate about good design. Of course our library collections provide reference material and communicate design issues to a broad audience – and the collection is not just books. We’re building 21st Century tools and platforms and skills to collect rich digital collections and enable Queenslanders to realise their own creative potential and create content in the digital world. We welcomed the opportunity to hear from Caroline about the design, education and the use of social media in Cooper Hewitt design museum’s outreach and public programs. I’m sure it will help us in developing new ways to enrich the lives of people in Queensland and beyond. It’s been a busy few days here in Brisbane! Caroline Payson, Director of Education at the Cooper Hewitt National Design Museum, New York arrived on Thursday morning and was propelled into a tight schedule of talks and masterclasses as part of the Social Media and Cultural Communication Conference agenda! 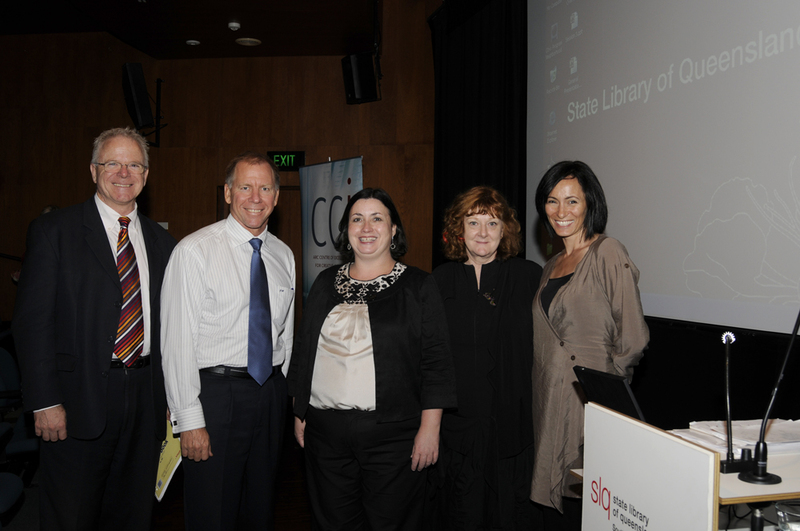 On Friday, State Library of Queensland hosted a public talk which was opened by the Minister for Arts, Education and Training, Hon MP Rod Welford who described the growing recognition of the value of design in Queensland. This represents a growing trend in translating traditional design education and practices into the broader educational curriculum and a movement away from design as product to design as process. Caroline Payson, Mei Mah, Tim Marshall and I wrote a paper reflecting this shift in 2007. The paper: The Effect of Social Media on Design Education: from product to Process highlighted the structured approach to formal and informal learning and the ways in which co-created content was both created and distributed as part of a larger museum initiative. Caroline ran two masterclasses, one for State Library of Queensland and one for Queensland Museum. We’d like to thank Anna Raunik, Vicki McDonald and Jill Eddington (SLQ) Kerry Cody (QM) John Stafford and Meta Finnamore (Arts Queensland) for making this series so successful. Thanks also to Arts Queensland for funding Caroline’s visit to Brisbane, to the Deputy Director General of Arts Queensland, Leigh Tabrett for hosting the government agency strategic meeting and to Lea Giles Peters for hosting the public talk at State Library of Queensland. In the lead up to the Social Media and Cultural Communication Conference 2008, I will be posting some of the issues which have driven the development of the conference. These posts are intended to provide a backdrop to the excellent speakers who will be with us in Sydney. Over the past year, our research has indicated that there are simple ways in which we can categorise the use of social media in the cultural sector. From simply beginning a conversation with our audiences, through to engaging in a co-creative relationship where organisations and audiences come together to produce new forms of cultural content, the breadth of social media provides the basis for structured many-to-many communication. By far, the issue we are most often asked about revolves around the ‘why’ of social media. Why use it in our organizations? How will it benefit our audiences? How will we maintain it? What value is there in this type of engagement? I think these questions are often asked because social media is sometimes being seen as a series of tools and less as a strategic form of communication. The small table above suggests that if we want to start a conversation with our audiences, then a blog is a simple and efficient tool to use. Yet, why would we want to commence a conversation? The planning module which Jerry Watkins, Sebastian Chan and I developed places these strategies and tools in a broader communication module to suggest that the sustainability of social media comes from an understanding of the purpose of communication, fit of purpose to audience and the appropriate tool. For instance, if we are considering a web presence which supports an exhibition and we are targeting this presence at K-12, then content sharing using online audio/video/pictures could provide the type of cultural engagement which we are attempting to achieve. How can we even think about social media when our collections aren’t digitised? There is a great deal of discussion around the digitisation of collections. A number of government agencies have produced reports which assess the need for structured funding to support the ongoing process. To add to this, I would like to suggest that we consider our ‘digital artifacts’ – those texts, pictures, videos, sound files and activities where our audiences can or have participated in an exchange with the organisation. How can we make better use of these artifacts and what environments or presence can we create to enable our audiences to collect this content and exchange it in meaningful ways? Our speakers from the Cooper Hewitt National Design Museum – a Smithsonian Institution will be describing the way in which they extended their online audience by relying on their digital artifacts to create new communities of practice. In 1996/96 the internet was beginning to be used in some of the larger and more technically-able cultural institutions around the world. Back then, we talked about the ‘Information Super Highway’ – the space where content and interaction could come together to usher in a new type of cultural engagement. As the internet took off and cultural organisations perfected their presence, the need to evaluate user-experience became critical. Across the sector, audience research took on a new measure, one where the challenge of identifying and categorising online visitors became a major task. With social media, this is now a more complex question, that is: how do we evaluate the experience of online visitation using social media? What measures do we use and how are they in keeping with other modes of evaluation within the organisation? How is funding attributed to these initiatives and how do we describe both the long and short term benefits? These are some of the questions which will be addressed throughout the Conference. I forgot to mention to you today the research I did about what Australians were doing online. Compared with US data, Australians are blogging, commenting, tagging and discussing at greater levels. However, those who visit museums and galleries participated in these activities in significantly greater numbers than non-visitors. These findings have broad implications for museums and their relationships with both their on-line and physical audiences. The data suggests that, not only do those who visit museums participate in more on-line activities, they are engaging in activities that are participatory and two-way. what does rthis mean for museum physical and online experiences? I gave a talk at the State Library of Victoria this morning on the Engaging with Social Media in Museums project. It was great to see so many interested professionals from the sector at the presentation. A couple of the questions raised revolved around the use of participatory design as a suitable methodology for designing social media initiatives. This methodology underpins the project and will be developed alongside the workshops over the coming months. 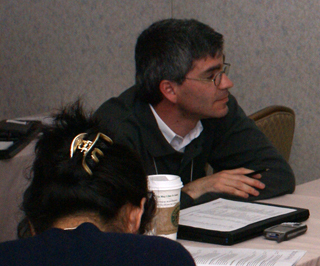 Jerry Watkins published the paper Social Media, Participatory Design and Cultural Engagement at OZCHI in 2007. You can view this paper here! Another question dealt with the need to be strategic in the planning of social media, in particular, recognising the link between a program’s intentions and the potential outcomes. Throughout the project we will be exploring mechanisms by which to evaluate the cultural experience of social media in relation to cultural institutions. For those of you in Victoria, the ‘Information in the Digital Age’ presentations are held on the first Tuesday of the month and are presented in association with the Australian Library and Information Association. You can email download the brochure at http://www.slv.vic.gov.au/programs/learning_program.html, email the Learning Programs at learning@slv.vic.gov.au or ring 0386647113 for more information! Thanks again for giving a very interesting presentation. And thanks again for answering my question. Sorry I didn’t get a chance to properly introduce myself. I am a User Experience practitioner working in the Web Services unit here at the State Library. I prescribe to a User-Centred Design (UCD) philosophy in which user research, prototyping, usability testing and design iterations are all central. I’m very keen to learn more about participatory design and some of the shortcomings traditional design (and UCD) may have with designing social media based experiences. It sounds like there are quite a few similarities between participatory design and UCD. Are there any seminal resources on participatory design you’d recommend people check out? Thanks for your question! You may find Jerry Watkin’s paper on Social Media, Participatory Design and Cultural Engagement valuable reading. The url is in the body of the blog post. – internal evaluation of outcomes. These are some thoughts which I’ve been considering for some time now and I offer them as a think-piece in preparation for the roundtable. I would be very interested in your thoughts! I wonder whether we need to consider people outside the walls of the museum ie people like me! How do we interact with the digital product that is served up to us. I know there has been some on-line discussion about how to correct obvious inacurcies in captions of photos found in Picture Australia. Authorative corrections have been sent in but are seemingly ignored. There is a larger issue of how all this relates to the Web 2.0 movement or will all this digital data sit around within the Museum and Library system? This sounds very interesting. Would you mind posting something in relation to your expertise so that I can have a chat with the organisers? Attended this roundtable yesterday and spent a very stimulating three hours in discussion. 1. Advocacy role and bringing funding bodies together with a range of institutions. 2. Awareness raising and training across the NSW sector with a focus on small institutions and CEOs. 3. 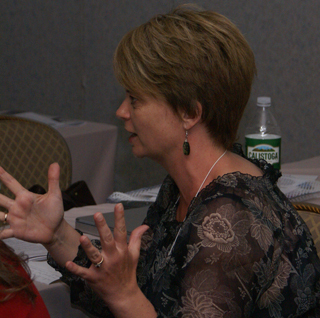 Facilitating the development of pilot programs. 4. Facilitating blue-sky sessions to challenge the sector, generate ideas and projects, and bring people together across a range of sectors. Again, the issue of what is Web 2.0 was raised, with a pretty low level of understanding of the concepts even in that room! To assist with this I have posted a basic “what is” guide to Museums and Web 2.0 on this blog. I also reminded them about our conference in February next year! Lynda – With regard to the digitisation angles – was the current Collections Council digital plan discussed? Is mgNSW responding to the current draft? Hi Michael, it wasn’t discussed as far as I recall, but Joy Suliman from the CCA attended the session. She did raise issues around the challenges of digitisation in regional areas, given the levels of technical skills and access to computers and the net. I assume it’s this report you’re referring to. I haven’t looked at it myself but looks like it’s worth checking out. I’ll ask the folks at mgNSW about your latter question. I did find out about a DCITTA-funded study of technology issues for museums and galleries across Australia, seems to have been some kind of needs analysis. That report won’t be released until November when the next CMC meeting occurs. We did discuss the CBN and how NSW is lagging behind, and what strategies we need to get something moving for NSW in that direction. Just a correction – Joy Sulliman is from CAN – not CCA. Taa, get confused with all the acronyms in our sector! Thanks for that Lynda. The needs analysis report will add an interesting dimension to the debate. There is also a new DEMOS report which I’ll post a review of, it goes some way to positioning this case within the broader creative industries agenda! On Wednesday 10th October I ran the Planning for social media workshop at the Queensland Museum. Approximately 30 participants from Queensland Museum and State Library of Queensland attended. Dr Paul Flemons, Geographic Information Systems (GIS) Manager Centre for Biodiversity and Conservation Research (CBCR) at the Australian Museum presented two micro-documentaries and discussed the impact of these on his practice. Paul participated in a co-creation workshop as part of the New Literacy New Audiences project and then went on to develop a second short film describing the TAPIR project. I’d be interested in feedback from the participants! At our recent New Literacy, New Audiences symposium, Lynda Kelly discussed some of the future possibilities for tagging at the Australian Museum. Among them was the potential to enable user-created video to reside alongside the official museum taxonomies and collection records. I was interested to read Seb’s post on Steam Locomotive 1243/1882 where he announced the first museum-created video addition to OPAC 2.0. I’ll be interested to see how the video is received by the community and whether it encourages other community members to contact the museum! We’ve spoken at length about the way that cultural institutions can use existing social media tools such as Flickr and YouTube, we’ve also refined our strategic approach to planning for social media. This PhM example hints at the convergence which is possible when user-generated content resides within the collection record, yet it uses a professional team to produce the video rather than community members or content experts. The resulting video is not then an example of co-creation and the fact that you can’t review it means that it doesn’t fall into the ‘social media’ basket, so does the video becomes an official element of the record or are we looking at the convergence of exhibition and collection in a newly created portal? I doubt the locomotive video will encourage people to contact the museum any more than they do already – predominantly via email or telephone. The purpose of including the video, and others that are coming, is simply to enhance the collection records through multimedia content. Museums collect a lot of oral histories around the collections and this is an example of making one of these publicly available. I wouldn’t say that this was the same as a ‘professional’ production – the loco video was a quick turnaround semi-pro production. Filmed on a single chip camcorder with no extra lighting simply because the driver was available only at very short notice, likewise the curator. We may invite wider public participation in an amateur way but we would be highly unlikely to do it with a broad generic collection. Rather we would work, as we do with the Migration Heritage Centre, target very specific communities and stories. Oh . . . . why not Youtube? Because unless we were trying to leverage the Youtube audience (as we do with the Sydney Observatory videos for example) then we prefer to keep these videos archived as part of our formal, and permananent collection management system record for the object (yes, the train driver oral history is now stored in our collection management system). How is this example of accessible multimedia record viewed by the curators? I recognise the curator with the driver which suggests that he approved of the approach. I suppose I’m wondering about the response more generally throughout the museum. Also, will this approach (multimedia record?) be targeted at trying to encourage specific target communities of interest and if so, are there any plans to support their future engagement, particularly through the collection of their stories? The curators have been filming oral history interviews with the community for several years now. The main reason they haven’t been put into the collection management system is the problem of digitisation and resourcing. We have lots of video tapes in research folders. One of the next big digitisation hurdles is the conversion of these research folders containing hand written material, other primary sources for which we may or may not hold copyright (eg newspaper clippings etc) as well as video and audio interviews to be at the very least catalogued, if not included, in our collection management system records. I’m still surprised that we accept the notion that collected research material relevant to an object is NOT catalogued as part of the researchers’ practice – but that is another issue! The problem is that it is not DIGITISED and remains in a physical research folder. A collection management system can only hold the research records and materials that have been digitised. This is why museums are only at the very tip of a very large digitisation iceberg. The Cooper Hewitt National Design Museum (CHNDM) a Smithsonian Institution in New York doesn’t do anything by halves! 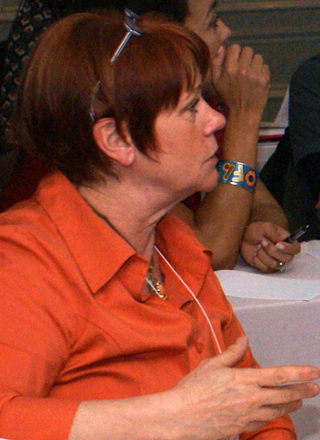 When they launched their Educator Resource Center in July 2006 they took an existing educational program along with a strong community of practice and developed a social media initiative which is unparalleled in the museum sector. By providing educational frameworks and networking opportunities, CHNDM has developed a comprehensive design resource which provides, among other things, community-created lesson plans to the educator community. So when Sebastian Chan, Jerry Watkins and I were asked to deliver our Planning for Social Media workshop at CHNDM on 19 April 2007 we were speaking with some of the most progressive social media users in the museum education sector. Caroline Payson, Director of Education and Mei Mah, Deputy Director of Education kindly organized the half day workshop at their New York premises. The workshop was attended by approximately 20 staff with varying experience in the use of social media. The workshop highlighted the value of social media in the museum and we benefited from hearing about the uptake of the educational resources at CHNDM. Caroline, Mei and I, along with Tim Marshall from Parsons School of Design will be presenting a paper on the use of social media in design education at ConnectED, International Conference on Design Education to be held in Sydney this coming July. Our work with CHNDM stems from the research I undertook with them in 2005 as a result of the Queensland Premier’s Smithsonian Fellowship program. Since then we’ve continued to collaborate on disseminating research regarding the use of social media technologies in museums. Caroline, Mei and I, along with Adam Blackshaw from the National Museum of Australia and Peter B Kaufman from Intelligent TV will be presenting a panel at the American Association of Museums Annual Meeting in May 2007. Digital Cultural Communication: How Social Media can create active museum audiences will provide another opportunity for our partners to share knowledge and to present the findings of our research. We’d like to thank Caroline and Mei for giving us the opportunity to run the workshop. Thanks also to everyone who attended! We look forward to their visit! “The majority of teens actively manage their online profiles to keep the information they believe is most sensitive away from the unwanted gaze of strangers, parents and other adults. While many teens post their first name and photos on their profiles, they rarely post information on public profiles they believe would help strangers actually locate them such as their full name, home phone number or cell phone number. At the same time, nearly two-thirds of teens with profiles (63%) believe that a motivated person could eventually identify them from the information they publicly provide on their profiles. Jerry, Seb and I have just finished the ‘Planning for Social Media Workshop’ here at Museums and the Web in San Francisco. Our workshop participants were very open about sharing their experiences of social media and the resulting discussions were great. We’ve uploaded the workshop powerpoint here (planning-social-media-for-museumsv6.pdf) and would be very interested in your feedback! – What types of social software do museums currently use? – How are social media audiences differentiated? – How do social media affect audience ability to create meaningful cultural experiences? – How can semantic web add greater fidelity to the collection record? This group will meet again in early 2007 to continue the discussion. I’d be interested in your thoughts on the preliminary descriptions! Wikipedia is suitable, indeed recommended, for encyclopaedic entries on all museums. However, further more extended use by museums for their own purposes is not encouraged or appropriate in general. If this is required, it is possible for a museum to set up its own wiki with suitable technical support. Alternatively, if support is not available, it is possible to use other external wiki facilities. A museums wiki has been set up expressly for this purpose and other experiments concerning museum-related information. Museums and people interested in museums are encouraged to add to this wiki and promote community use of it. This wiki is intended to be available for continuing use by museums for the foreseeable future. For information on documenting museums on Wikipedia, see the paper “Museums and Wikipedia” from the 2006 Museums and the Web conference. It is recommended that you read this paper first before attempting to edit the Museums Wiki. You are welcome to interlink Wikipedia museums pages and pages on this wiki if you wish, as appropriate. The Museums Wiki is best for more detailed multi-page information, whereas Wikipedia is appropriate for a one-page entry on most museums. Do contact me if you have a particular project in mind and need any advice. However wiki technology encourages experimentation and it is reasonably easy to correct mistakes in any case. It is likely that I will keep an eye on activities on the Museums Wiki, but may make changes as appropriate, especially with respect to categorization of pages. Seb Chan from the Powerhouse Museum has just posted a revealing article on the new on-line collection database OPAC 2.0 which was launched in June 2006. In six weeks, OPAC 2.0 has been responsible for increasing visitation to the Museum’s website by over 100%! This post looks at some of the trends over this time. OPAC 2.0 provides an excellent best-practice example of how digital collections can be augmented and explored using social media technologies. The system enables audiences to self-classify using folksonomies. This function is a tangible example of how audiences can personalize their visit to the museum website and builds on the early “virtual curator” discourses which were prevalent in the early days of the web. I’m particularly interested in OPAC 2.0 because it demonstrates how social media technologies can bring together similar assets (collections, activists/protagonists, audiences, content creators) to engage in conversations around specific issues. Both museums and users of social media are beginning to recognize the value of partnering to share their assets and create conversations which add meaning to museum visitation. These new partnerships are possible because of the joint interests which the two communities share, that is, information exchange. Whereas the museum has traditionally focused on knowledge transmission and institutional scholarship, social media supports conversations between individuals and communities of interest in the pursuit of knowledge, entertainment, shared interests and social networks. The social framework of the 21st century museum supports these two discourses as it is distinguished by its ability to create interactive spaces in which audiences can interact with and engage with content, the institution and others. Examples such as OPAC 2.0 demonstrate how museums can actively redefine their relationship with audiences by providing infrastructure and access to content which shifts visitor experience from passive consumption to interactive engagement. It also provides the metrics to support the notion that social media can be used to encourage visitors to engage in scholarly debate and the interpretation of collections. These are initial thoughts on how the ‘long tail’ of collections might continue to evolve. I’d be really interested in thoughts on this! In the meantime, congratulations to Seb and his team for providing such an excellent example of the future museum!! This post details some basic Web 2.0 concepts with links to cultural institutions/other sites where relevant. These definitions come from a mixture of sources, primarily the social media wiki specifically Short A-Z definitions, and the Audience Research wiki. “Web 2.0 is a term coined by O’Reilly Media in 2004 to describe blogs, wikis, social networking sites and other Internet-based services that emphasise collaboration and sharing, rather than less interactive publishing (Web 1.0). It is associated with the idea of the Internet as platform” (Short A-Z definitions). See The Machine is Using/Us for a clear explanation of Web 2.0. “Social media describe the tools and platforms people use to publish, converse and share content online. The tools include blogs, wikis, podcasts, and sites to share photos and bookmarks” (Short A-Z definitions). What do Web 2.0/social media mean for museums? “Web 2.0 puts users and not the organisation at the centre of the equation. This is threatening, but also exciting in that it has the potential to lead to richer content, a more personal experience.” (from Museums, organisational barriers and Web 2.0, Ellis and Kelly 2007). Museums and Web 2.0 blog post – has useful links to papers from MA 2007 on social media and museums. “Blogs are websites with dated items of content in reverse chronological order, self-published by bloggers. Items – sometimes called posts – may have keyword tags associated with them, are usually available as feeds, and often allow commenting.” (Short A-Z definitions). Although often seen as “personal” online diaries, blogs can be so much more than that. For example, Mel Broe kept a blog called museum journal as a record of her internship at the Australian Museum, Sydney, allowing her to make posts and her university supervisor and her work supervisor to add comments and suggestions. “Forums are discussion areas on websites, where people can post messages or comment on existing messages asynchronously – that is, independently of time or place time. Chat is the synchronous equivalent” (Short A-Z definitions). The Great Climate Change Swindle Discussion Forum: ABC. “A podcast is audio or video content that can be downloaded automatically through a subscription to a website so you can view or listen offline.” (Short A-Z definitions). Video content is now often referred to as a vodcast. “A wiki is a web page – or set of pages – that can be edited collaboratively. The best known example is Wikipedia, an encyclopaedia created by thousands of contributors across the world. Once people have appropriate permissions – set by the wiki owner – they can create pages and/or add to and alter existing pages.” (Short A-Z definitions). It is worth noting that “36% of online Americans consult Wikipedia … [it] is far more popular among the well-educated than among those with lower levels of education … 50% of those with at least a college degree consult the site, compared to 22% of those with high school diploma” (Pew Internet Report Wikipedia Users, April 2007). “Feeds are the means by which you can read, view or listen to items from blogs and other RSS-enabled sites without visiting the site, by subscribing and using an aggregator or newsreader. Feeds contain the content of an item and any associated tags without the design or structure of a web page.” (Short A-Z definitions). “RSS is short for Really Simple Syndication. This allows you to subscribe to content on blogs and other social media and have it delivered to you through a feed.” (Short A-Z definitions). “Tags are keywords attached to a blog post, bookmark, photo or other item of content so you and others can find them easily through searches and aggregation.” (Short A-Z definitions)). Social bookmarking is a process of sharing links with others. Instead of having your favourite websites listed just on your own computer, using a site such as del.icio.us allows you to have all your bookmarks in one place and also to share them. culture online: shared links for web managers in Sydney cultural institutions. This is a very interesting article. If this year the AM is “looking at about 21 million online visitors” this means we get about 2/3rds of all on-line visits to Museums in this part of the world. Our web team and content providers are to be congratulated! It will be truly to see whether these and future results impact on Museum exhibition practices and/or policies. We could do a study of it ourselves! Can I simply just say what a relief to discover an individual who truly understands what they are talking about on the internet. You definitely understand how to bring an issue to light and make it important. A lot more people ought to check this out and understand this side of the story. I can’t believe you’re not more popular since you certainly have the gift. A motivating discussion is worth comment. I believe that you ought to write more about this subject matter gamestore, it might not be a taboo matter but generally people do not talk about these issues. To the next! Kind regards!! I can’t tell you how fast you will see results because it depends on how much you want to get rid of acne. Individuals who have suffered with acne look forward to the day when they can look in the mirror and see skin that is pimple and blemish-free. Extended hair can cause your physique pimples to get worse if you do not wash it typically, and make confident that it is genuinely cleanse. Your write-up has confirmed necessary to me. It’s really useful and you really are naturally extremely knowledgeable in this area. You possess popped my personal face in order to numerous opinion of this particular topic with intriguing and solid content. couldn’t discover one, I would really like to become a fan! I enjoy your valuable data you actually present on your content articles. I’m going to take note of your blog along with have a look at once more right here frequently. I’m just relatively a number of I will be educated a lot of innovative information right here! Good luck for an additional! the resulting symptoms is actually to drink more water. Out with the three a kettle is most likely going to be the cheapest to acquire and you may already have one inch your home. Pretty wonderful submit. I found your site and needed to express that I’ve got seriously beloved surfing around your website articles. In fact I shall be opting-in as part of your feed using this program . wishing you write yet again immediately! but keep tuned. Then I took these dietary supplements and now Im again in shape. access to certain sites from your phone or computer. the content they might share online. in market. The science behind Adiphene consists of 12 of probably the most power fat preventing ingredients known. future, the researchers want to find out whether a combination of several educated in the gastrointestinal tract hormones can further enhance the effect of the gastric band. the shortage of dangerous uncomfortable side effects.